Amazon Game Download Store to reach the UK in October? Amazon's Game Download Store - finally on its way to the UK? Amazon is set to release its Game Download Store in the UK in October, according to the latest reports. The PC game download shopfront, which has been live in the US since February 2009, is said to be currently in the testing phase on our fair shores and heading towards a full rollout in autumn. According to MCV's sources, the UK version of the store was meant to open in April 2011, but has been subject to delays for undisclosed reasons. 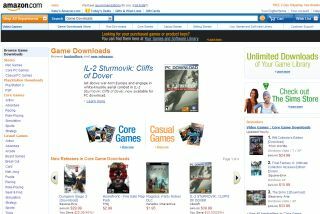 The Game Download Store in the US began life as a casual gaming vendor, but has recently started selling the bigger hitters for serious gamers in download form. The Amazon service is part of a growing industry of digital game distribution, with Steam still serving as the granddaddy of the bunch. Amazon won't be abandoning physical gaming, however, with the current US version of the store offering either the digital or boxed edition to customers.